Home » Nootropics » Vivvid Review: Can It Really Help Your Brain? Nootropics are becoming a massive trend so it is not surprising to see this many of them hitting the market in recent months. Today, we are taking a closer look at one of them made by BELD Labs. It's called Vivvid and seems to have a couple of aces up its sleeves. Ready to take a look at it? Let's go! In the last decade, people have gone crazy about these sorts of pills. Millions use it on a daily basis, and almost can’t function without them. Main reason for this need is the fact we as individuals have a lot of obligations and tasks to do every single day, which drains a huge supply of energy and focus. These sorts of supplements are designed to provide all the necessary nutrients for your body to efficiently deal with everyday tasks. Today we are taking a look at VIVVID: Magnum Mental Support formula. At first look, it seems good and also comes for a fair price. But is that really the case? Sometimes people get carried away too fast and decide to purchase something that just isn’t worth their money. To make sure you are not one of those, we are putting this one on a research and checking out is it actually worth buying and how can it improve your performance and efficiency. With that being said, we will not only be going to take a thorough look at its ingredients but also at the provided user feedback. Vivvid Ingredients – Is this 777 a lucky one? 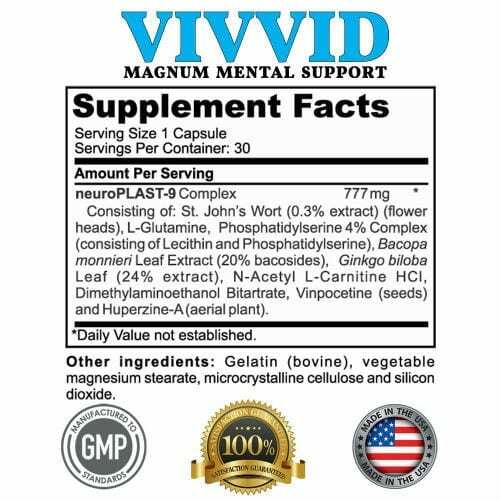 The main part of VIVVID: Magnum Mental Support is neuroPLAST-9 Complex, designed for you to experience a lot of benefits. This one is an essential amino acid with a big list of potential benefits and improvements. It promotes brain health and even has an impact on muscle growth and athletic performance. 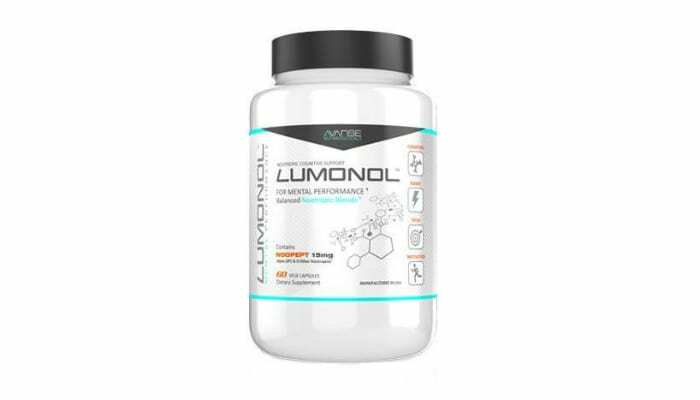 It truly is an amazing compound capable of making a change on its own, and the addition of few other supplements in the blend can surely take your lifestyle to another level. The main part of this complex within the complex is Phosphatidylserine, and the secondary role belongs to Lecithin. Such a mixture can possibly improve attention and memory. Extract from this plant is capable of putting you in some troubles with side effects, luckily VIVVID: Magnum Mental Support contains it in very low dosages, which will most likely keep you safe. It is most often used for treating depression and insomnia. Some research studies indicate Bacopa Monnieri has a positive impact on hand-eye coordination in children and can improve memory in healthy adults. Ginkgo is one of the most popular compounds on the list. People all across the planet use it on a daily basis and witness its amazing properties. It has found many uses, with the most popular being improved blood flow, enhanced focus and better memory. Yet another great compound widely used as a supplement on its own. It can be effective for reducing nerve pain, treating male infertility (improves sperm movement), fighting depression and lowering fatigue. Better known as DMAE or Deanol is a compound naturally occurring in our bodies. It comes with a lot of benefits and is extremely effective. People use it for a variety of different stuff, most popular being improved memory, mood, and relaxation. Some say it is even good for inducing lucid dreaming, which doesn’t sound very helpful at first, but can result in few other positive effects. It is extracted from a plant called Chinese Club Moss. Before getting Huperzine-A, plant undergoes through a few laboratory processes, so we don’t really consider it as a natural compound. Some evidence indicates it is good for increasing energy levels, improving alertness and overall mental function and brain health. VIVVID: Magnum Mental Support contains a good amount of ingredients capable of making a positive impact on your brain health. NeuroPLAST-9 complex is packed with some of the highest graded compounds, and the only problem with it is the unknown exact dosage for the ingredients inside. For this reason, it is hard to estimate its real value, but since most of the ingredients are high quality, I don’t really see where it can lose some of its positive properties. All in all, the mixture is packed with some powerful stuff, and the only thing keeping us from naming it great is unknown dosage for the compounds of the formula. VIVVID side effects – Can it hurt you? If you are healthy you shouldn’t worry too much about the potential side effects from this nootropic. You could experience few minor ones such as dizziness or nausea, which you can get from almost every supplement currently on the market. However, if you are already having some health issues such as cirrhosis, liver disease or mania, you should stay away from VIVVID because it can make your condition much worse. It is also worth mentioning you should stay away from it during pregnancy and breastfeeding. What do other people have to say about its effects? Most of the people who tried VIVVID shared a positive experience, and that is something to look for while trying to find something effective. VIVVID: Magnum Mental Support is easy to get, and with only a few clicks online you can get it delivered to your address. On the other hand, if you are looking for the best deal, click here. The Final verdict on this product! I am glad people asked us about this one. Nootropics are becoming more and more popular and it is important to get the clear picture about something that is going to have an effect on your mind and body. Most of the users are having a positive experience despite the fact it is possible to get some side effect which can ruin the experience. To summarize – VIVVID: Magnum Mental Support is a good nootropic, and after few usages, you should experience more than a few changes. It is capable of boosting focus, improving memory, enhancing mind clarity, and making a long-term improvement considering cognitive health. It is a main complex in the mixture containing 9 ingredients for optimal results. Ones we consider the best and the most efficient are Bacopa Monnieri Leaf Extract, Ginkgo Biloba Leaf and Dimethylaminoethanol Bitartrate. The mixture is specially designed to improve cognitive function. It should boost focus and concentration, improve memory, increase alertness, and improve overall long-term neuro health. This is a complex a within complex, containing phosphatidylserine mixed with lecithin for maximum results. The main role of this blend is to increase attention and make sure you get all the memory improvements you can get. It can also fight anxiety and depression while at the same time lowering cholesterol and improving liver health. There haven’t been enough scientific studies showing such a complex can have a big neuro impact. It can be described as a stronger than usual heartbeat. Such a state shouldn’t last for a long time, and it is most likely a reaction of your body to something new in the organism. If it lasts for a prolonged period of time make sure to contact your doctor. Usage of Gingko Biloba can result in such a side effect. It is a state of abnormally high levels of energy, euphoria, affect and arousal. Someone experiencing mania can also have difficulty maintaining attention, elevated mood and inflated self-esteem. Such a state shouldn’t be caused by this supplement, but it can get much worse for someone already experiencing it. What can increase symptoms of mania? If you are experiencing mania make sure you stay away from high dosages of L-glutamine, which is the case with VIVVID. How much does Vivvid cost? If you purchase it via this link, you'll end up paying just $39.99! Judging by all I've seen, I'd say it works just fine. The ingredients are on point and the users are satisfied… The only problem I see is with the unspecified dosage amounts. Other than that, Vivvid seems pretty good! Like I've already mentioned at least a couple of times, Vivvid can be purchased here for just $39.99. Vasst Review: Can This Nitric Oxide Booster Help You Achieve Better Gains?